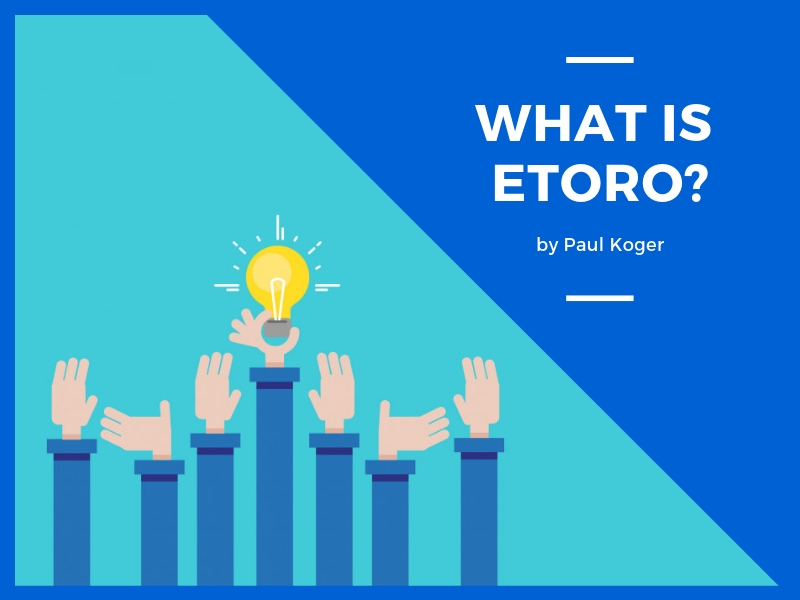 Home Resources What is Etoro? Etoro is a forex, commodities and stocks broker with one major twist – it allows to copy other traders with your own account. It is possible to trade normally and make the decisions by yourself, but one very powerful addition is the possibility to automatically copy people that are more experienced and have proven to make money in the past. If you’re interested in a more thorough review, read my overeview of Etoro. 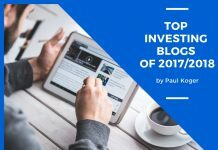 There I’ll go over who it is for and what are the main pros and cons of the trading platform. The platform has a super userfriendly interface. 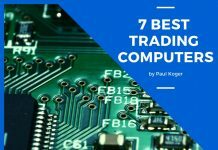 I say that because compared to other brokers, that use Metatrader 4 interface, Etoro platform is very easy to use and navigate in. 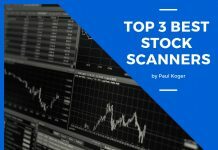 It has been designed mostly for beginner level traders. And having that in mind the outlay serves new traders well. Although if you are a more advanced trader, you probably would like more options to customize the chart, add more indicators, backtest and more instruments to trade in. However most of the above is not something that a newer trader is interested in and hence, it fits well in order to help you get started. The main feature that is especially good for those that are just starting out is the possibility to copy other traders. By doing that you are able to mimic the trades of advanced traders and also learn from them. When starting out, most people have no idea how to get going – copytrading function will help you in this situation. In order to select who you would like to copy, you are able to sort others based on their past performance, which is not indicative of future results, remember that, but it can give you a pretty good idea of what the traders are capable of. In addition to the percentage of money they have made, you can also check the biggest downfall of their portfolio and other risk indicators. It is important to choose someone that suits your risk profile. Usually the more the person is making, the more risk they are taking. Risk and reward go hand-in-hand and this is very much the case with Etoro as well. The social part of the platform also allows you to ask questions from Pro traders and discuss different strategies and ideas. You also get to see the overall sentiment of other traders on the platform, this means that you can see how many traders are long or short an instrument. Etoro was founded in 2007 by Ronen Assia and David Ring. The company has a headquarter in Limassol Cyprus, Tel Aviv, Israel and also in London UK. The company has over 4.5 million users from more than 100 countries around the world. Etoro is sponsoring West Ham United football team in the English Premier League. 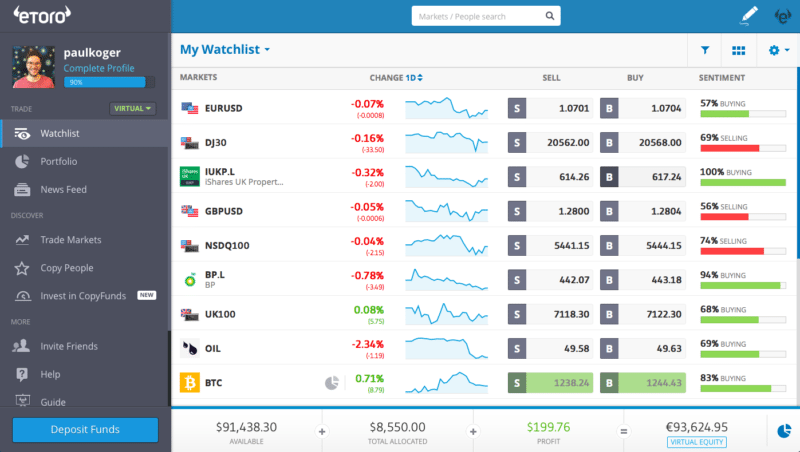 The main instruments that are tradable on the platform are currencies (including Bitcoin), commodities, indices and stocks. 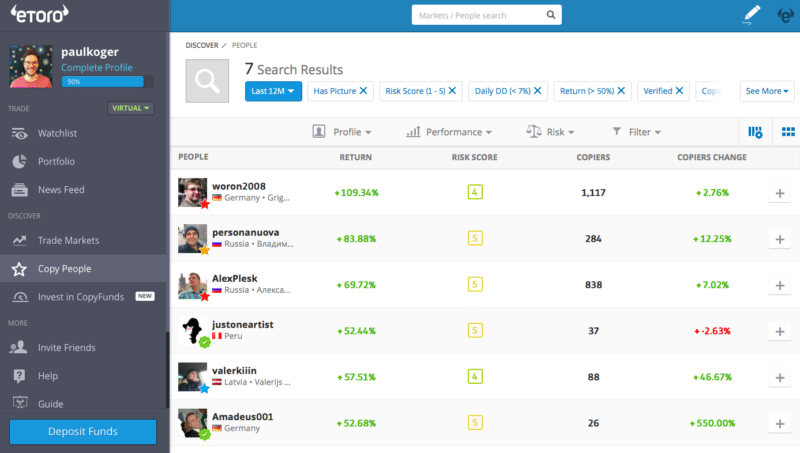 Etoro is a trading platform with a twist – ability to copy other traders. 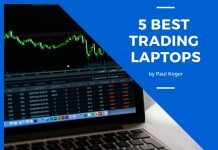 It is a good trading platform for beginner traders that are starting out and are still learning the basics and searching for a profitable strategy. 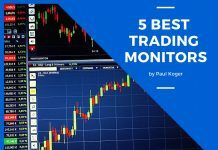 To fulfill these goals, Etoro is a perfect option, however if you are a more experienced trader, you might want to look for a more advanced platform.